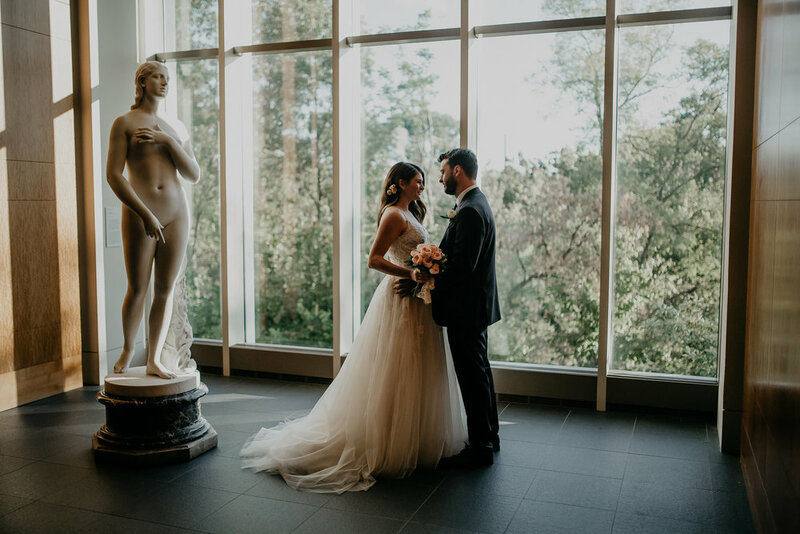 Moon white dahlias, smokey pink roses, and yards of foliage in a spectrum of greens enhanced the old world beauty of Abby + Bart’s Cincinnati Art Museum wedding. Abby's wedding gown is like a waterfall in the evening; layers and layers of water, thick and ethereal. She carried a bouquet of papery pink peonies tied with a wide cream vintage lace fabric which was simple and timeless. 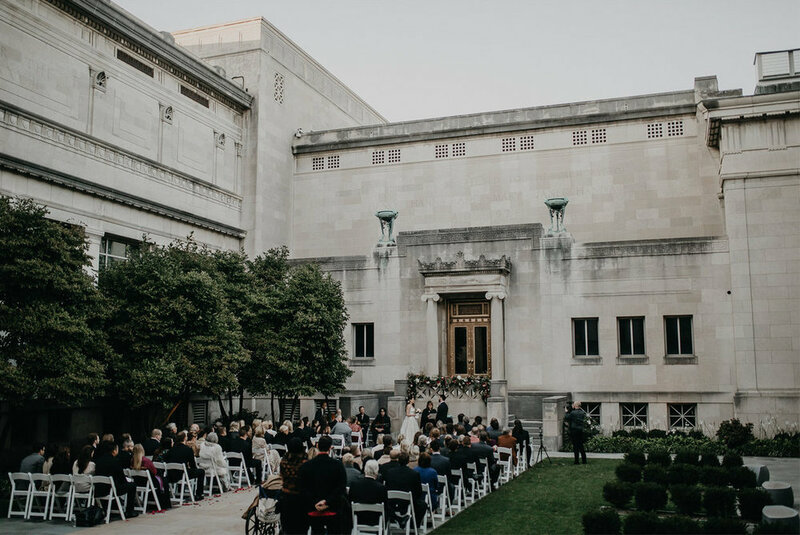 The ceremony took place in the museum's outdoor courtyard which is hemmed in by cool stone walls. 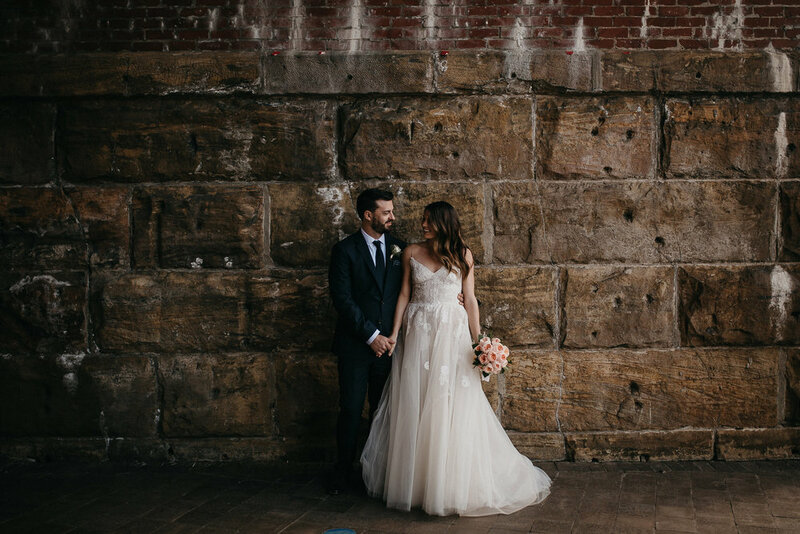 Being wrapped in the belly of the historic building creates a dreamy, otherworldly ambiance which was perfectly, stunningly captured by Nicole Leone Miller Photography. 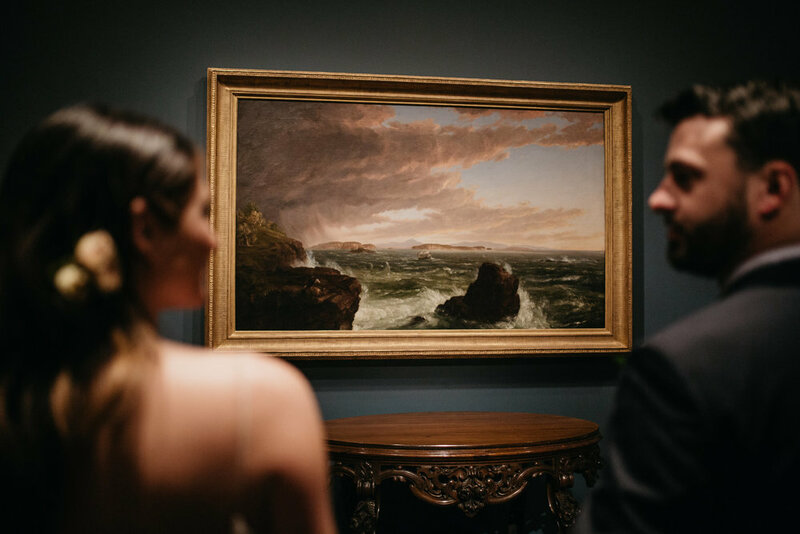 Miller's photographs of Abby + Bart's wedding capture the essence of the mystery and wonder one experiences looking back into time by way of a brushstroke, a still life with tulips, silver cutlery, apples painted 400 years ago. Sculptures, smooth stairways, a pergola, and carefully tended garden beds full of blooming white hostas created a beautiful, tranquil atmosphere in the courtyard. 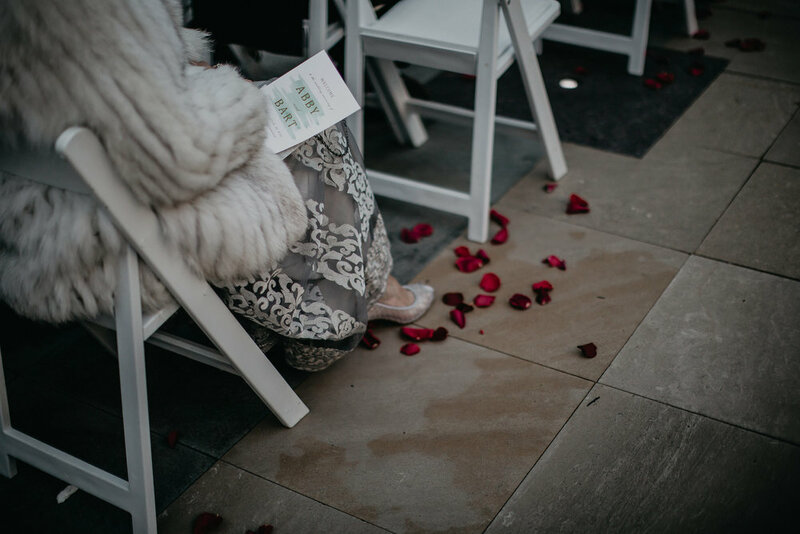 Guests sat in rows of white wooden folding chairs set on the broad stone walkway which was soon peppered in deep red rose petals. 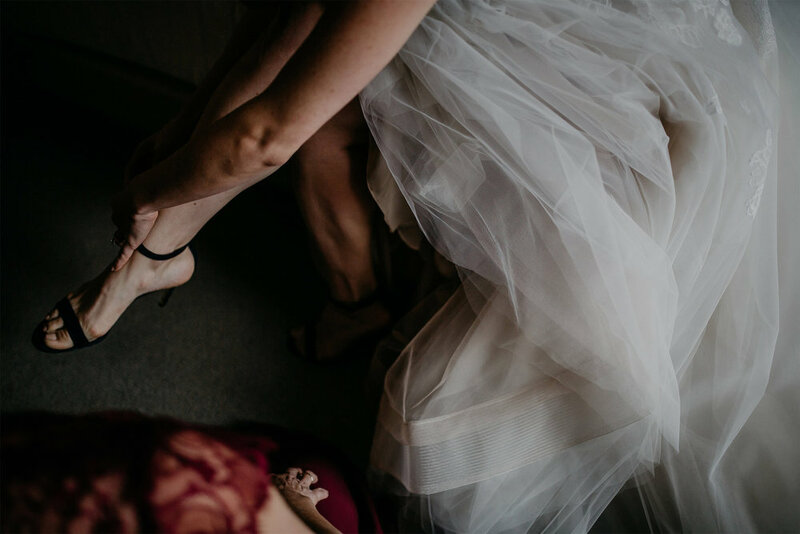 Abby + Bart were married at the foot of a carved stone stairway landing dressed in a floral swag of astilbe, dahlias, rich red roses, and greenery. A subtle dusting of peony departed from the usual pale and its thick layers of cockle pink petals captured lines of shadow on the fall day. Geodes, sea glass blue watercolor dinner menus, and musky gold rock crystals captured the warm glow of the strung cafe lights in the main hall where the reception was held. We created a sweetheart table with velvety red roses, dahlias, garden roses, and lots of greenery. 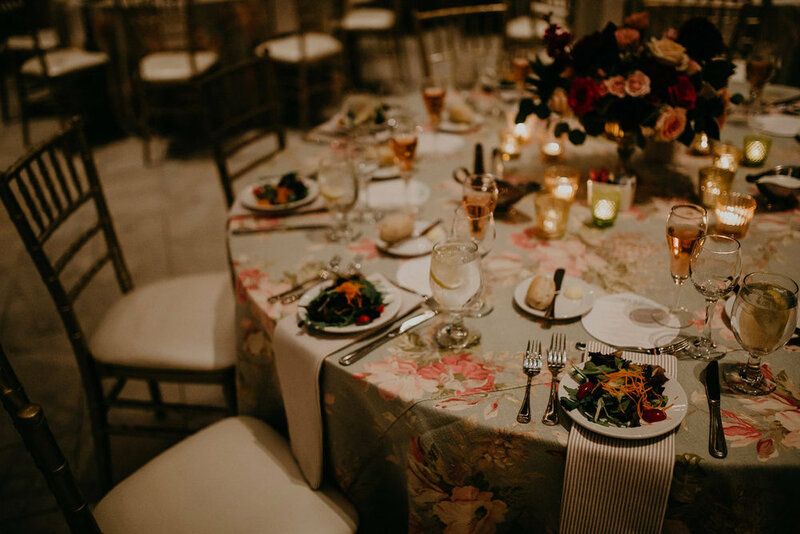 Guests sat at large circular tables covered in beautiful vintage inspired floral duck cloth. The floral large pattern was subtle against the pale green beige background. Guests danced and dined under warm honey colored lights which hung like stars on a perfect, clear Queen City night.